The ulu knife is an innovative all-purpose cutting tool that originates from Alaskan Eskimo culture and dates back to as early as 2500 BCE. Traditionally, ulu knives would be passed down from generation to generation - so buying one means you may have a new family heirloom on your hands. The original Ulu knives were typically used by Inuit, Yupik, and Aleut women and were designed for daily tasks like cutting hair, skinning animals, and cutting blocks of snow for igloos. 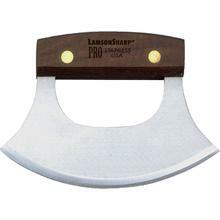 The unique design of an ulu knife means that you can ‘pin down’ what you’re cutting, since you’re putting pressure on a handle and rocking the blade back and forth. Since you’re able to apply force to the center of the handle, which is directly above the center of the blade, one-handed cutting is easier and provides more control. KnifeCenter is the original and largest online catalog of cutlery, and that includes the most useful selection of ulu knives on the internet.